7/15/2008Share this story on Facebook! Volunteer! Be a part of the festival and get in for free! The GrassRoots Festival of Music and Dance, held on the second-to-last weekend in July, is one of the most anticipated events of the summer for many Ithacans. The festival has become firmly cemented as an Ithaca tradition. 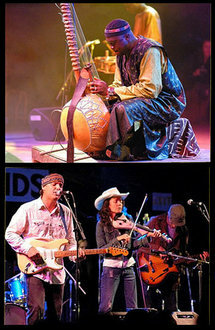 It focuses on folk, root, and world music. The festival is held at the Trumansburg Fairgrounds, located about 10 miles north of Ithaca. Festival-goers can either commute to the campgrounds or pitch a tent and immerse themselves in the GrassRoots experience for all four days and nights of the festival. The musical line-up is a mix of long-time local favorites like Donna the Buffalo as well as a host of new bands. There are over 60 groups scheduled. To fit them all in, some acts will perform late into the night on all four of the festival’s stages. There’s even an all-night Cajun and Zydeco dance party in the dance tent--the bands won’t stop playing until the sun comes up. The festival originated as a one-night concert at the State Theatre held to benefit AIDSwork, a local AIDS support organization. The featured artists were Donna the Buffalo, The Horse Flies, and Neon Baptist. Because the night was such a success, members of Donna the Buffalo decided to try and organize a festival that would continue to benefit the fight against AIDS while exposing local musicians to a wider audience--and GrassRoots was born. There will be plenty of food vendors at the festival, offering everything from vegan-fare to hot dogs, though festival attendees are allowed to bring their own food and drinks (including alcohol if you are over 21, though coolers and IDs will be checked at the door). There’s also a grocery store across the street from the campgrounds. Volunteers who work for a total of 12 hours at the festival will receive a free pass. Volunteers can sign up ahead of time or, according to the website, you will most likely be able to sign up right at the festival. Volunteers are required to provide a credit card or safety deposit, in case they do not complete their full 12 hours of service, in which case they will be charged the full price of a festival pass.